How Do Landlords Choose Rental Property? If you’re buying your first rental property, you probably have a list of questions a mile long. How much rent should I charge? How do I know if I’m paying too much for the property? How do I make money? How do I choose tenants? How do I choose a rental property in the first place? This post is about that last question: How does a landlord choose a rental property? If you put that question to a hundred landlords, you’ll probably get a hundred different answers. Different properties work for different people—for different reasons! Of course one must consider price, return on investment and expenses when evaluating rental property—but smart landlords also consider their future tenants, too. Identify your target tenants: Every business needs a thorough plan, including your rental business! Include a profile of the type of tenant you want to attract. Remember that you cannot discriminate on the basis of race, gender, religion, ethnicity, family structure, or disability—but you are certainly free to limit your tenants to the ones who can pay rent on time and who are within a certain income bracket. If you want higher-income professionals, don’t buy a multi-unit building in a shady section of town. If you want to rent to stable families or well-employed folks, concentrate on the type of unit they will want to call “home.” If you don’t care what type of tenant you have, as long as they pay the rent on time, then the type of property does not matter as much. Some people will rent anything, anywhere. Think about what your target tenants want: Some landlords like the low-rent business—they find inexpensive properties in lower-rent areas of town, and make a nice profit on them. But purchasing a rental property in a higher crime area will not attract families looking for a safe place to raise children. They prefer safe, owner-occupied areas, because they want to live in a nice neighborhood. Location is most important to tenants, so evaluate the area’s offerings: safety, good schools, shopping, and convenience to amenities, like parks. What type of turnover will the property have? Again, it’s a question of stability. Longer-term tenants will settle in a home. Shorter-term tenants often think of their current rental as a temporary stop on the way to the next place. You might make more money on the latter, by charging a higher rent or increasing the rent with each turnover, but the headaches that go along with high turnover are not for everyone. How many bedrooms should you look for? Again, it depends on the type of tenant you want to attract. Want singles? Buy units with one bedroom. Want families? Look for three-bedroom homes. Curb appeal: If you’re considering purchasing a that looks sad from the street, consider what you can do to improve it. Whether or not you take a pass depends on the price and the investment needed to make the unit attractive. Just as homebuyers are attracted to a nice-looking home, so are the best tenants. If you don’t care about what your rental property looks like, you’ll attract tenants who don’t care about where they live. Keep tenants safe with proper deadbolt locks. Nobody wants to receive a phone call like a landlord we know recently did: “I just slipped on some wet leaves and tore the ligaments in my knee.” Luckily, this landlord has plenty of insurance to cover just such an incident—but as everyone knows, making an insurance claim can lead to higher rates or even cancellation. Landlords and property managers must do their due diligence when it comes to keeping tenants safe. Being prepared and performing a little hard work can go a long way to preventing problems that lead to injuries, lawsuits, and losses. 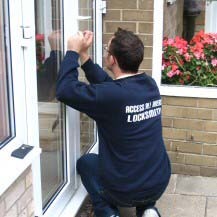 First, make sure your properties have sufficient locks on all the doors and windows. Deter criminals with good lighting, and keep shrubs away from windows. Make sure your tenants understand the importance of key control, and advise them in writing against venturing out alone—especially if the neighborhood is historically sketchy. Don’t rely on tenants to alert you to broken locks or burned-out lights. Do your own periodic inspections to stay on top of these issues that can cause a landlord to lose a lawsuit in a heartbeat. Give each tenant an evacuation plan. Provide escape ladders if second-floor bedrooms can be cut off from exits in case of fire. Also, provide fire extinguishers in the kitchen and at least one other room. Don’t require tenants to rake leaves or shovel snow. Either do it yourself, or hire professionals to take care of the grounds. Whether it’s from a pile of wet leaves or a slick patch of ice, tenants can be injured on your property if it’s not well maintained. There is no magic formula to prevent any and all injuries, but it still will benefit the landlord or property manager who does everything possible to keep the property safe. And, the courts see it as the owner’s responsibility, not the tenant’s. Conduct safety inspections. You should keep your eyes peeled every time you enter your rental property, but be sure to also schedule periodic safety inspections. Look for problems with broken or rotted stair treads, wobbly railings on stairwells, porches, or decks, and windows that don’t operate properly. Make sure locks are easy to operate, and smoke and CO2 detectors are functioning. Trim broken tree limbs before they come down on a tenant’s head. Finally, keep communicating with your tenants. Provide them with more information than you think they need—it could help you win a court case someday. Write up a list of safety tips, and firmly state your visitor and key policies in your lease. Alert tenants whenever maintenance or construction projects will be going on, and advise them to avoid the areas being worked on. And remember to check in with your tenants—ask if all their safety equipment is working properly, or if doors and windows are getting stuck. Keep communicating and you’ll find out what needs to be addressed much sooner—which could possibly prevent and injury for a tenant, and a lawsuit for you! Remember, protect yourself and your property by screening tenants prior to leasing. For more landlord resources, including forms and information on tenant screening, turn to E-Renter.com. You’ll know that you have the best possible tenants when you prescreen tenants. It’s rather difficult to find anyone who has not been affected by the economic troubles of the past year. That includes people who want to be your tenants. 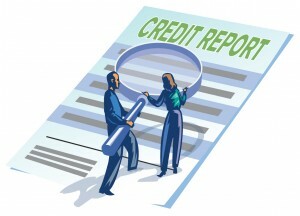 What should you look for when running tenant credit checks these days? If everybody’s credit is bad, why bother to do a credit check? Should landlords and property managers lower their standards in light of the rise in rental vacancies? Read on for answers to these questions. Why bother with a tenant credit check when it’s going to be bad? Besides, if I skip it, I save money, right? Actually, the money you invest by doing thorough tenant screening will more than pay for itself when you consider the long term cost of evicting and/or cleaning up after bad tenants. And believe it or not, lots of folks are making it through the down economy by spending less, saving more, and keeping their credit records clean. Should I lower my standards? This is a tough rental market, with rents down and vacancies up. You must decide whether to keep your qualifying standards high—and face empty units—or take a chance by lowering them in order to fill your properties. Experienced landlords say that empty units are far better than renting to bad tenants. It all depends on your tolerance risk, your cash flow—and a lot of luck. Can I ask why a prospective tenant has had a bankruptcy? Yes. There is no time like the beginning to start communicating clearly with your tenants. If there is a bankruptcy on the credit check, ask what happened. You may find out that medical bills forced the tenant into bankruptcy, or that an ex spouse was actually the cause. Of course, if the tenant has other red flags on the credit report, you must take them into consideration, too. Take a wide-angle view of the tenant’s credit history. If a bankruptcy is several years in the past, and everything else checks out, they may be an acceptable risk. If the bankruptcy was due to a business failure, the economy could be to blame—not the tenant. Past evictions and utility judgments are a higher risk indicators to many landlords than bankruptcies. Do not ignore your gut instinct. If someone seems untrustworthy, they very well might be. Only you can decide whether a poor credit score or bankruptcy is worth the risk. The important thing is to perform consistent tenant credit checks! 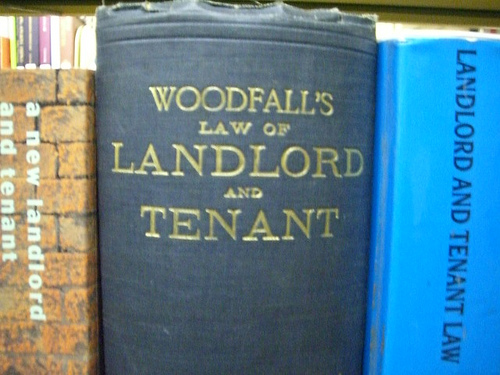 The relationship between landlord and tenant should be strictly a business one. Landlords must abide by a variety of federal, state, and local laws designed to protect tenants. Breaking a law, even unintentionally, can spell big trouble to a landlord. And rental property is too valuable to allow tenants to occupy it without the full protection of a legally binding agreement. It’s a mistake to let property without a proper rental agreement or lease. To do so opens a landlord to a great deal of risk, possible financial loss, and even litigation. A rental agreement allows a tenant to occupy property for a short period, often 30 days. And, it allows the landlord to increase the rent, change the terms, or terminate it altogether with a short written notice (usually 30 days, but that depends on each state’s laws). This type of agreement renews automatically at the end of the 30 days, unless the tenant or landlord gives written notice that it will end. This is a typical month-to-month type of rental situation. A lease obligates both parties to a set of conditions and terms for a set period of time, usually one year. During the term of the lease, the landlord cannot raise the rent, and the tenant cannot move out, unless each party operates within terms of the lease that cover these areas. Landlords cannot ask tenants to move out until the lease expires. Either party can decide to not renew the lease with proper notification. Breach of the lease terms can result in eviction of the tenant by the landlord, or litigation between the parties. Typically, the lease covers areas such as rent amount, term, rent due date, parking regulations, property care and maintenance, landlord entrance, pet policy, and other legal matters. Rental agreements are more common in areas with high turnover, or where rents are increasing and rentals are in short supply. Leases are preferred by landlords where vacancy rates are higher or where tenants are harder to find. Whether you decide to use a rental agreement or lease, the important thing is to make certain you are fully protected under a solid and binding legal document. Pre-Qualifying is about finding the people who fit the minimum requirements you set for income, references, job and credit history. Proper tenant screening will further narrow the field by giving you solid background check results to base your decision on. Pre-Qualifying is not about discrimination. As a landlord, federal law prevents you from using a person’s race, color, religion, nationality, familial status, age, gender, or disabled status to determine housing eligibility. Your state may have additional guidelines. Pre-Qualifying is about laying the groundwork for a great landlord/tenant relationship by communicating clearly and effectively from the start. Pre-Qualifying is about reducing tenant turnover by avoiding broken lease agreements and evictions. Pre-Qualifying is not about judging applicants based on personal appearance, the car they own, or the number of people in their family unit. Pre-Qualifying is about applying the same rules and requirements to all applicants. Pre-Qualifying is a way to reduce your risk by keeping tenants with previous criminal convictions or negative rental histories out of your rental properties. Pre-Qualifying is started by advertising your property for rent in the right publications, including enough information to weed out individuals who are not a good fit for your rental. Every landlord should consider pre-qualifying tenants. While it takes effort to begin any new procedure, it will soon be a habit—and this is a habit that will pay off through better relationships with your tenants and increased profits for you! What are the guidelines when it comes to a landlord’s ability to enter a tenant’s apartment or house? It depends on your state’s laws, but in most, the landlord must provide notice prior to entering a tenant’s home. Do check your state’s landlord/tenant laws: they can range from “no notice required” in Massachusetts, New Jersey, and several other states; to 12 hours in Florida; to 48 hours in Vermont. Don’t worry about advance notice in cases of emergency, such as natural gas odor, smoke or fire, or a water leak. Don’t “knock and unlock.” Allow your tenants to answer the door, even if they are expecting you. Don’t assume they’re not at home and let yourself in. Do offer more than the required notice if you can. Do specify a window of time they can expect you. And try to stick to it. Call them if you’re delayed or early. Do leave your tenant’s home in the same condition you found it. If your shoes are muddy, remove them before entering. And clean up after yourself. Do conduct inspections and maintenance on your rental properties with the goal of maintaining your tenants’ privacy, too! A landlord we know wouldn’t dream of performing his own property maintenance. Show Dave a leaking faucet, and he’s soon pulling out his Blackberry to call a trusted plumber. But this year, Dave is seeing a trend he hasn’t dealt with before—his profits have been squeezed by more tenant turnover and reduced rents. So Dave has decided to learn how to take care of minor repairs and routine maintenance on his rental properties—and he’s probably not alone! More and more landlords are becoming their own handymen and women. If you’re one of them, here are a few tips and tricks that might come in handy. Use separate tool totes for each area of maintenance. Purchase inexpensive handle totes: blue for plumbing, red for painting, green for general repairs, and so on. Load each tote with the appropriate tools and supplies—and don’t forget to include How-To manuals or books! Each tote should contain an assortment of screwdrivers, screws, bolts, and nuts, as well as gloves appropriate to the task. The general repair tote will serve you well if you stock it with duct tape, wood glue, super glue and drill bits. A level and socket tester will both come in handy, as will a razor blade/knife tool and socket wrench set. A hammer and a rubber mallet are musts. For your plumbing tote, make sure you have channel lock pliers, plumbers’ tape, and an assortment of wrenches. Load your painting tote with painters tape, spackle and a spackle knife, plus touch-up applicators filled with the standard paint colors you use in your properties. These look like shoe polish applicators, and can be found in hardware stores. Cordless tools will be your best friends! Make sure you charge them after each job, so they’re ready to use again. With economic challenges continuing, you might need to learn how to perform repairs and maintenance on your income property—but remember to call in the professionals for potentially dangerous and complicated jobs, like electrical work and major carpentry or plumbing repairs! Do you have a guest clause in your lease agreement? If so, your tenant has agreed that no guests can stay in the rental unit longer than the time specified on the lease. For some landlords, that’s seven days; for others, fourteen. And some specify no guests for more than fifteen days out of any thirty-day period. If your current lease agreement does not contain this important clause, make sure you add it before you sign another lease with this or any other tenant. This way, you will avoid a sticky situation: when your tenant allows a guest to stay indefinitely in your rental property. On one hand, your tenants are free to certain enjoyment of their rental unit, including entertaining friends and hosting guests. But on the other hand, when a guest becomes a permanent fixture, you could be held liable for their actions. Having an unknown entity living in your rental unit puts you at risk, along with your other tenants, and the neighbors. Hands-on landlords must balance staying on top of their tenant’s activities with being a nosy pest. However, you have every right to know what’s going on in and around your property. So, when you observe a guest at your rental unit who appears to have moved in, it’s time to ask the question. If you’ve established good communication with your tenant, then asking if “Joe-Bob,” “Alison,” or “Spike” have moved in is completely reasonable. If the tenant is a good one whom you’d like to retain, then take a rational approach. Be prepared to offer options to your tenant: if they have broken the rules outlined in the lease, then they need to have the person leave, or add them to the lease—with proper background screening, of course. It’s vital that you enforce the terms of your lease completely and evenly—every rule applies to every tenant. And, it’s important that your tenants know you mean business and that you expect them to live up to their agreement. Letting something like this slide can only lead to further—and possibly larger—problems. Of course, hands-off landlords don’t often know who’s coming and going in their units—so their tenants can get away with stretching the terms of their lease. After all, if you’re not paying attention, they’re probably not going to tell you!